Holcombe is an Inglenook-style shunting layout based on the British Rail blue years, built by Peter Marriott. 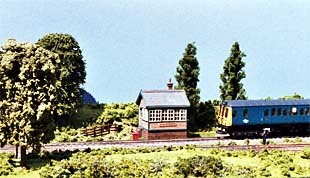 The little layout measures 1.5x.4 metres (60″x16″), and depicts a small station on a Cornish branch line in the 1980s in England. The track plan consists of a single-track “main line” serving a simple “halt”-style platform, with two short sidings — a basic Inglenook design. Pete is having a lot of fun shunting (switching) on this board, but is also considering a second baseboard to the right, extending the main line and the sidings, to add more capacity. Holcombe sidings are somewhat longer than the traditional Inglenook sizes — the two sidings hold 4 and 5 cars respectively, and the platform line holds 10 cars. As a result, fairly long trains can be assembled, and Inglenook switching puzzles tend to be slightly more complex than usual — or, if only the canonical 8 cars are used on the layout, the puzzles become much easier because the sidings will store more cars waiting to be switched. The photos above and below show the layout and rolling stock — a Lima Class 121 DMU handles the passenger traffic, while shunting activities are performed by a smooth-running Bachmann Class 25 diesel locomotive. Continuing our coverage of unusual and unconventional pizza (circular) layouts, here’s a Christmas treat from Denmark. Per Møller Nielsen and his family one year replaced their traditional Danish four-candle holiday decoration with this elegant little “pizza” layout, and liked it so much they have continued the tradition. 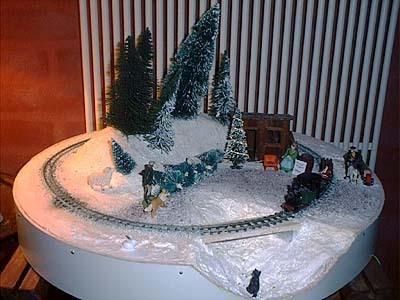 An unusual feature of this display, which is one metre in diameter is the scale — it’s built to 1:32, using 9mm trackage. 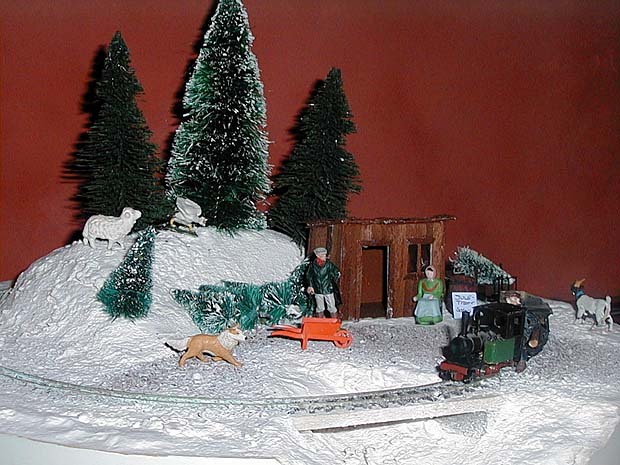 As there were no commercial 9mm narrow gauge trains available in 1:32, Per built his own rolling stock on N scale wheels using HO scale body dimensions to represent a 1:2.7-sized “park” model railway serving the Christmas-tree farm on the hill. Got that? Details vary from year to year, with one highlight having been an illuminated tree up on the rise (not shown here). Per runs a small but sophisticated CAD/CAM modeling operation, described at his website. He’s also active in the Danish Industrial Railway Society and their restored narrow-gauge railway, Hedelands Veteranbane (The Hedeland Vintage Railway). It always gives me pleasure to learn that visitors to this site are building layouts based on ones they’ve seen here. So it’s a pleasure to introduce you to a work in progress, The Switchers World (Part 1), by Michael Homscheidt in Germany. Michael started with Emrys Hopkins’ Timewaster 5:40 from our Micro Layout Design Gallery, made a few changes, and developed his own operating plan for the layout. You can read all about it at his website. We’ll look forward to showing you some photographs as work progresses on the line.